Many clients choose to use their mystery shopping provider to dispatch customer feedback surveys as well. This is a great idea, as the data is all collected on one portal, making the data capture more efficient for companies. Over the years, clients wished there was a way to easily see data from their feedback program incorporated into the mystery shopping report. Well, the time has come! 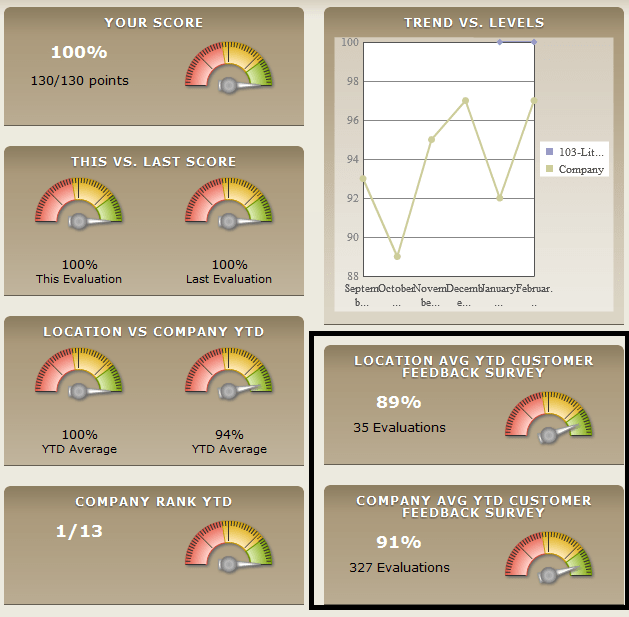 One of our new features allows the satisfaction score to be displayed on a mystery shopping report. When customer feedback programs capture data filtered by the location the customer visited, this data can be imported on a location specific basis. Because the dashboard widgets at the top of the mystery shopping reports are fully customizable, you can choose how you’d like to see the data so it makes the most sense to you and key stakeholders. Just another nice feature we wanted to share!